This is the third post in our series with our awesome sponsor Yuba bikes all about biking with kids! 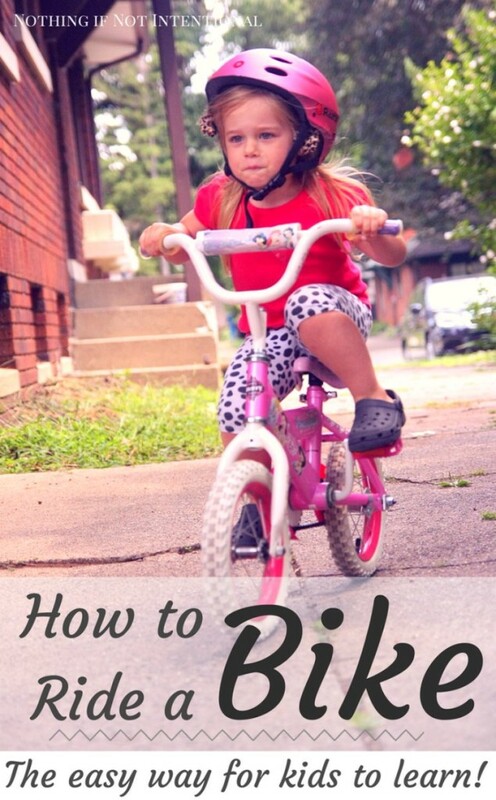 You can read our favorite ways to make family rides MORE fun for little ones HERE and our painless yet practical bike safety refresher course HERE. Can you guess what made this epic milestone almost anti-climactic? I think that most (all?) 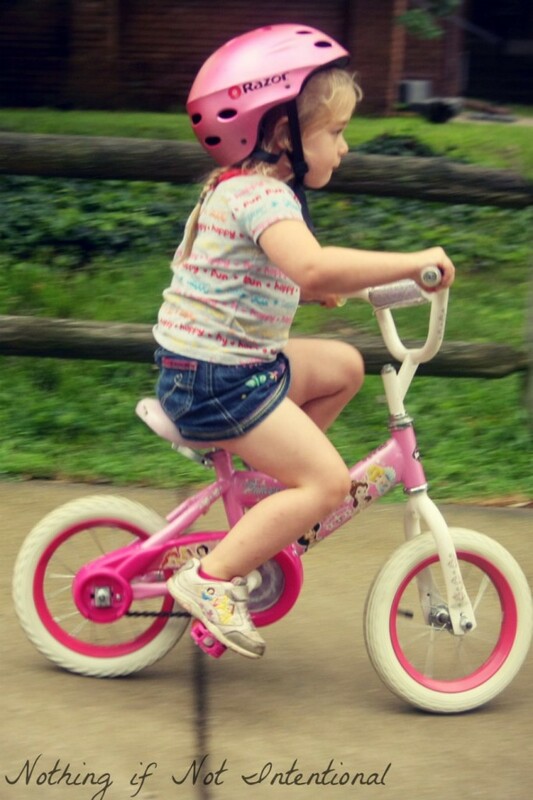 of the credit goes to the fact that she started on a simple push bike without pedals or training wheels, which is commonly called a balance bike. 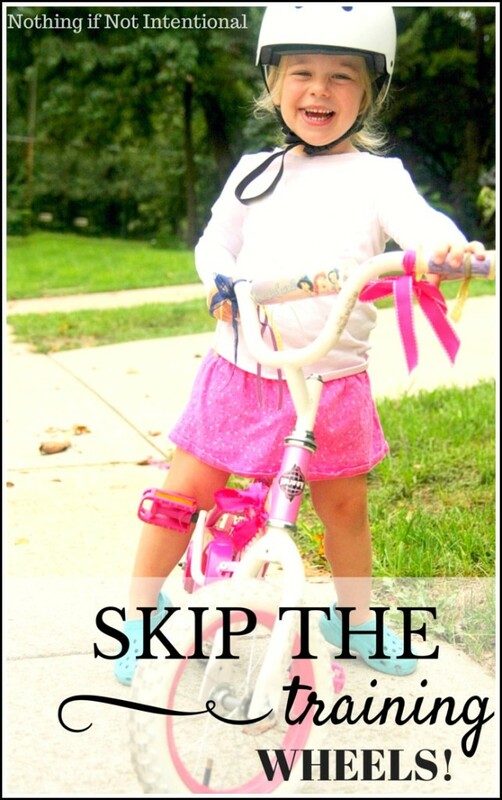 But kids who start on balance bikes conquer the hardest parts of riding a bike (balancing & steering) first. 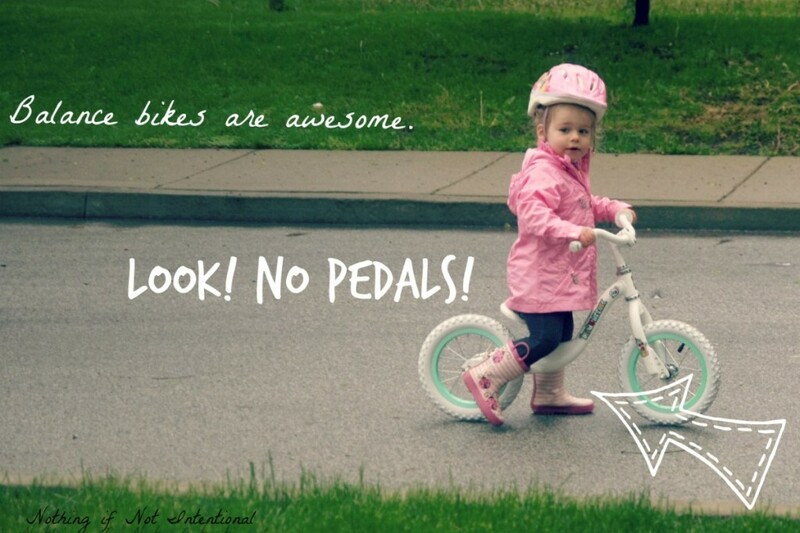 After that, pedaling is easy to learn. 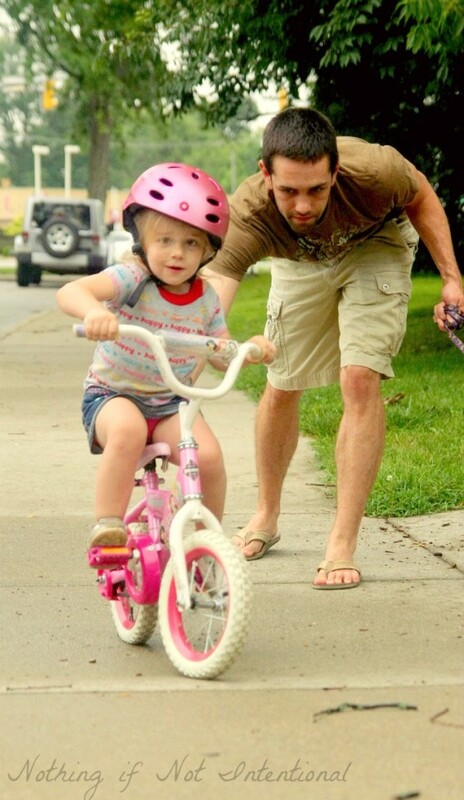 We started the balance bike when our daughter was two. For the longest time, she just pushed/walked the bike wherever she needed to go. But sometime last summer (a few months before she turned three), the whole “balance” thing clicked. She learned that if she pushed hard and then picked up her feet, she could coast and move much faster. With that said, we recently ran into a family whose three-year-old was struggling with the transition from the balance bike. The little boy was struggling with how to ride a bike because he found the pedals hard to operate. For our daughter, the pedals were no problem. She had ridden on a bike with training wheels many times. But she preferred (and was much faster on) her balance bike. According to this picture, we’ve always struggled to find helmets that fit! Read more about our bike safety issues HERE. 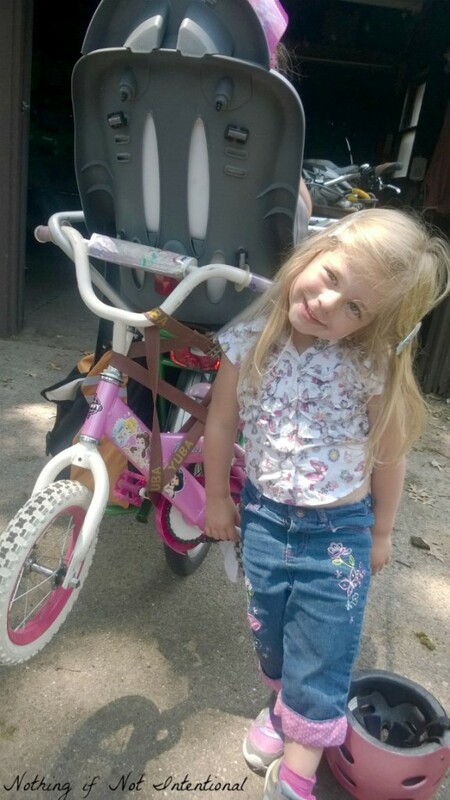 Since she understood how to pedal and how to balance, we decided to go ahead and take the training wheels off of her trike. Daddy gave her a bit of coaching, but It literally took her ten minutes to get the hang of the no-training-wheels pedal bike. Check out the video (it’s only a minute long!) below or by clicking HERE. The first clip is from one of her very first moments riding by herself. She and Daddy had sprinted out the door and to the bike a few minutes before me. By the time little sister and I got our shoes on and made it to the curb, big sister was already riding by herself! By the end of the video (two weeks later), you can see that she no longer needs us to help her start or walk (run!) beside her. She’s had a few (three or four) falls, but nothing major. The last crash she had was because she was riding with no hands. Now she looks like she was BORN to be on a bike. Fearless, that kid. By the looks of it, these two are destined for the circus. Also, my three-year-old doesn’t have the necessary endurance. I’m riding about 40 miles per week on the Yuba. Again, not impressive to the spandex-wearing racers, but much too far for a preschooler. Oh, and there’s the whole issue of safety. Do I really want her riding solo on the roads? Nope! Some of our routes include a nice bike trail or two, but most involve streets and intersections that sometimes make my palms sweat. I’ve heard you can DIY a balance bike, but you can use our affiliate links to find plenty of balance bikes ready-made on Amazon! THIS brand is super popular, but ours was closer to THIS price point. Our goal this summer has been to replace as much of our time in the car with time on the Yuba Mundo as possible. So far, we’ve ridden over 200 miles in 5 weeks. My girls love the scenery. I love the exercise. The environment loves the lack of pollution. If you want a green SUV (for once that’s not an oxymoron! 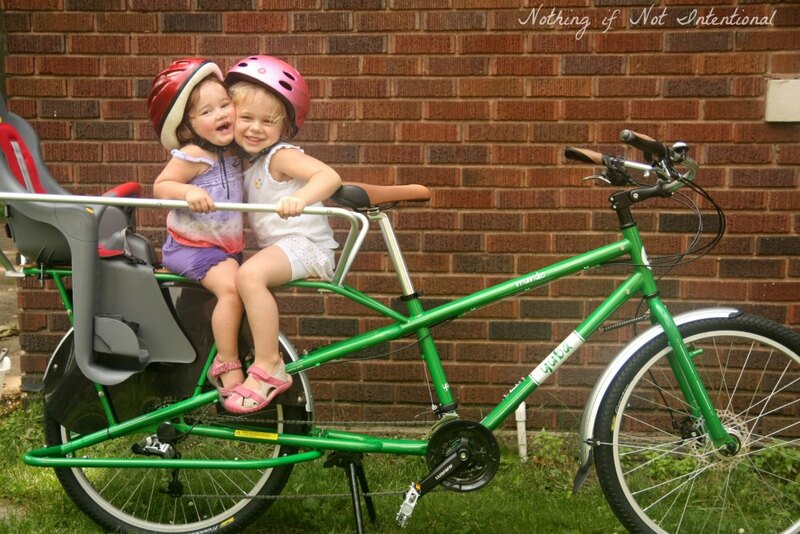 ), I promise you’ll love the Yuba too. For more biking fun, follow us on pinterest! 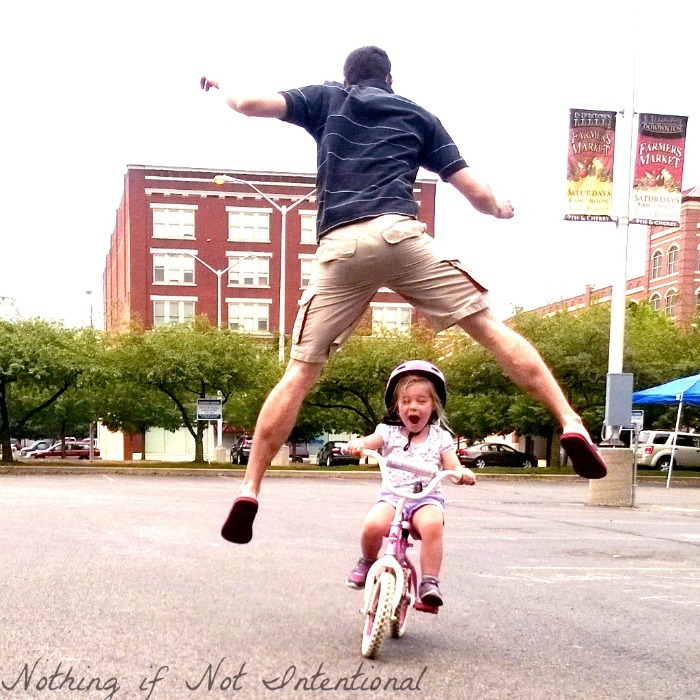 Follow Rachael at Nothing if Not Intentional’s board Biking with Kids on Pinterest. This is great info & so exciting as my son is just about a year behind you daughter (he turns 3 next month) & loves his balance bike. Congrats to your daughter–loved the video! Aww, yay, Kate! Thanks for reading and watching the video! Can’t wait to hear how the transition goes at your house!